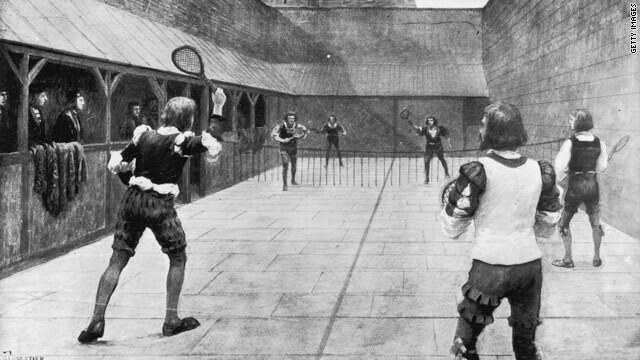 An illustration of a game of Real Tennis being played during the time of King Henry VII, circa 1500. (CNN) -- From the royal courts of England and France to centre court at Wimbledon, from Henry VIII to Federer the great, the game of tennis is steeped in history and tradition. The precise origins of tennis are disputed, with some historians dating it back to Ancient Egypt. According to the official Web site for "Royal Tennis," the game was played in fifth century Tuscany in Italy when villagers struck balls in the street with their bare hands. A more definable version was played by European monks, mostly in Italy and later France, in the 12th century, based around a closed courtyard. As it became more popular with the aristocracy, Real Tennis, as it was termed, grew in popularity, particularly among the French nobility and reached its peak in the 16th century as the rules and equipment became unified. Francis I of France, who reigned from 1515-47, was reputedly an enthusiastic player and was responsible for the building of many courts and also promoted the sport among a wider cross section of people. Not to be outdone by his French counterpart, on the other side of the English Channel, Henry VIII (1509-47) was a skilled practitioner of the sport and famously built a court at the Royal Palace of Hampton Court, which still survives today and is used for modern competition. Henry's second wife Ann Boleyn was watching a game of Real Tennis in Whitehall when she was arrested, and according to the official Web site of Hampton Court, legend has it he was playing when told she had been executed. That was clearly not a "love" match but from Real Tennis it is generally accepted the modern tennis scoring system and terminology evolved. The love has its origins from the French word for egg "l'oeuf", symbolizing "nothing" as Lesley Ronaldson, a Real Tennis professional, who lives at Hampton Court, told Open Court. "In lawn tennis it's 15-30-40 games, abbreviated from 45 in 1800," she said. "The game evolved in Italy and moved to France and the scoring system evolved from there where everything was done by 15, so that was the natural thing to do to score points in 15s. "And love for instance, love was something you did for nothing, you did something for nothing, it comes from there," she added. Even the word tennis has French origins from the medieval era, derived from the tenez, from the verb tenir, to hold. It was shouted out by a player about to serve in the same way a golfer hitting a drive in the direction of others shouts "fore." Real Tennis continued to grow in popularity and was widely played in the 17th and 18th century, but by the French Revolution and with European royal families besieged, interest dwindled. Other racket sports also emerged such as racquets, squash racquets, and eventually lawn tennis, which is widely credited to an Englishman, Major Charles Wingfield, who patented the equipment and rules for the game in London in 1874. His efforts were refined by the All England Crocquet and Lawn Tennis Club, who staged their first tournament on the lawns of Wimbledon 1877, with Spencer Gore winning the men's singles and the grand sum of 12 guineas ($18). They adapted Wingfield's original version to play on a rectangular court and over the next few years made further changes to lower the net, reducing the size of the box into which the service could be hit and allowing overarm serving. The "let" was also quickly introduced, giving the player a second chance when his delivery hits the net cord and falls into the correct service box. Remarkably, the rules and scoring system for tennis have hardly changed since the 1890s with the adoption of the tie-break in the 1970s, being the only major difference. With the tiebreak coming into play when two players are tied at six games apiece, this shortens the potential for marathon matches and was first widely used in the professional game. The four grand slam events where also established in this era, with Wimbledon in 1877, the U.S. Open four years later, the French Open (1891) and Australian Open in 1905. They remain the holy grail for the tennis elite, while in team competition, the Davis Cup was established in 1900 with the women's equivalent, the Federation Cup, now the Fed Cup, launched in 1963. What has changed dramatically is the rewards on offer for the leading players, linked to the establishment of the professional game, which had its roots in the late 1920s as stars names looked to make a living from their talents. The U.S. Professional Championship was first held in 1927, but it was not until 1968 that the four grand slams allowed professionals to play, beginning the modern "Open" era. Before that, top players established their reputations with a string of grand slam wins before turning professional and touring the world to play in a limited range of tournaments and lucrative exhibition matches. With the Open era, professional players formed their own associations and circuit, with the men's ATP (Association of Tennis Players) formed in 1973 and the WTA (Women's Tennis Association) a year later. Outside of the grand slams, which remain under the auspices of the International Tennis Federation (ITF), every major individual tournament in the world is now controlled by the ATP and WTA. With the professional era has come an explosion in prize money, sponsorship and television revenues, with leading players such as Roger Federer and Maria Sharapova among the richest sportsmen and women in the world. Federer and women's singles champion Serena Williams both earned $2.1 million for their victories in the latest grand slam at the Australian Open and make millions more through endorsements and other commercial interests. But for all the cash now on offer, it's the thrill of head to head competition and the quest for hitting the perfect stroke which drives the stars of today and in that respect perhaps little has changed from medieval times where the ego of kings was a stake.